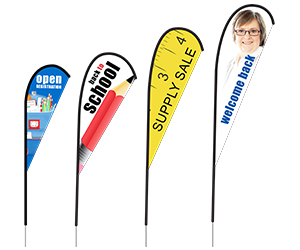 We offer 11 Different Sizes and Styles of Feather Flags - Order Your Back to School Feather Flags Today! 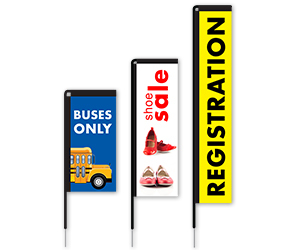 Feather flags can be used to generate excitement for back to school events. They can be used for school and universities, as well as for back to school sales and events. 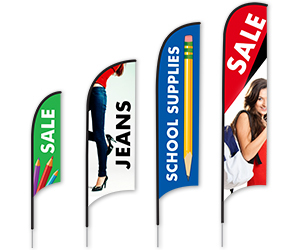 Our feather flags are printed in full color, and can have a variety of different bases. If you have any questions about our feather flags, please contact our customer service team! All of our customer service representatives are trained graphic designers, so if you need help with your artwork, we can help!